I've started off with 5 Biddy's Sister and 5 Biddy Early, germing them the usual way - in wet paper towel which in turn gets put in the cupboard where the boiler is, seem to get results quick this way with it being a nice tempreture in there (touches wood). Was considering these for an outdoor grow. Are they not normally an outdoor variety? All the best with your Magus double grow,doing the same funnily enough! Hafta ask Gerrit how he came by the 'Biddy' name? can i type faster than rockster whom i see replying already? Nice one Bazza! 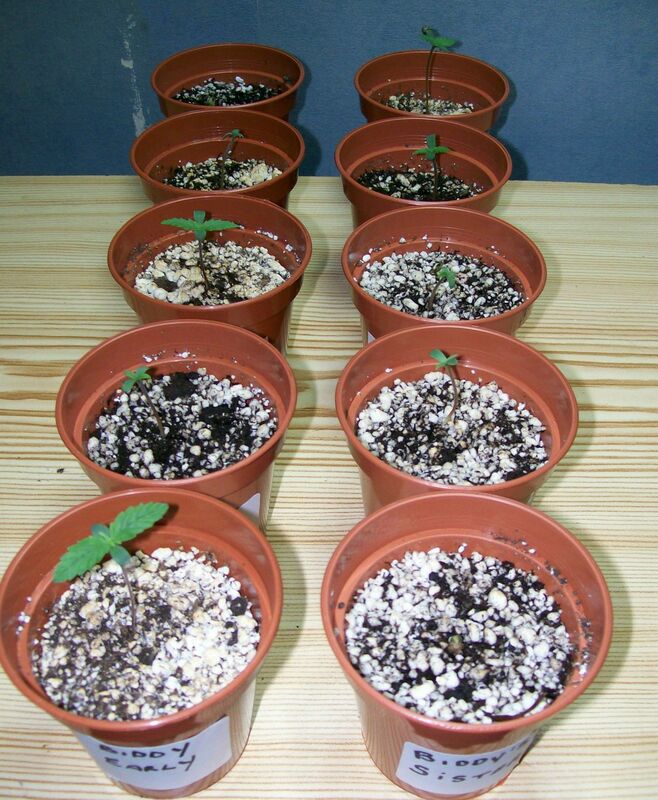 i got 5 of the biddys sister ma self from a kind geezer out grow shop and i shant be planting them now till ive seen how you fair. sounds like you are using identical kit to me there and abouts. all the best with yer first grow of 2008 Baz!! my biddys will be gettin germed in the next couple of weeks. all the best with the grows every1, i want to see some big fat sparkley buds so i know what ive got to look foward to thanks again to joolz and gerrit for the seeds. good luck every1. Good luck, it will be nice to see them side by side. @ Dr. Rockster, I've named the Biddy Early after an Irish legend, see cut and paste below. I thought it was appropriate since she was just a herbs lady that got prosecuted for witchcraft in the old age because people where afraid for things they could not understand, nothing changed much since huh? Also, the name of a witch fits well next to Warlock and Magus, I wonder if there are any Irish members among us that know about the legend of Biddy Early. Especially the first verse of the song makes a perfect fit to "Mary" i.m.o. THE LEGEND OF BIDDY EARLY - WITCH OR WISE WOMAN OF CLARE? Biddy Early was a well known figure in County Clare in times past. - in Kilbarron, Clare, the tales of Biddy Early are still told. Born Bridget Ellen Connors in lower Faha in 1798, the daughter of John Thomas Connors and Ellen Early, she married four times but was always known by her mother's maiden name, because it was believed that her gifts were inherited through the female line. She is said to have been a witch, with her cures and potions but perhaps she was a woman before her time just dabbling in herbal medicine. Biddy married four times and her final home was in a cottage on Dromore Hill, overlooking a lake which became known as Biddy Early's Lake. This home in Kilbarron is identified with Biddy 'The Healer', 'The Wise Woman', 'The Witch'. There are many stories of the opposition of the clergy, and in 1865 she was in Ennis charged with witchcraft under the 1586 statute. The case was dismissed 'due to lack of sufficient evidence against the accused'; those who were to give evidence remained strangely silent! She died in April 1874. I sing of Biddy Early, the wise woman of Clare. for she can heal a broken leg or a broken heart.  a tiny coffin twinkles and if it sinks, you die. It rises, you grow better and slip out of pain. It's time for bed," the tinker said, "but pass the cup again. The reason I have chosen Biddy's Sister is rather simple, I've used the same mother but a different father hence Biddy's Sister. Many thanks for the detailed answer about Biddy Early,Gerrit. A choice of name that when explained does fit in rather nicely with the Warlock and Magus. Hope all goes well for you mate, sure it will. Grown out Biddy Early and Biddy's Sister and I have to say that the Biddy Early was by far my fave. A lovely euphoric stone-completely positive always. Really slender Sativa-esque leaves and very open buddage, covered in sticky trichs, sweet on the nose with a very slightly earthy flavour...Beautiful!! Only trouble was, (as warned in the bumph) that she was impossible to keep as a Mum without 24hr light and at the 18/6 regime in my Mum room she went mad, flowering for all she was worth. She was lovely and I cried the day she went into the flower room to finish out. Ahh fond memories. 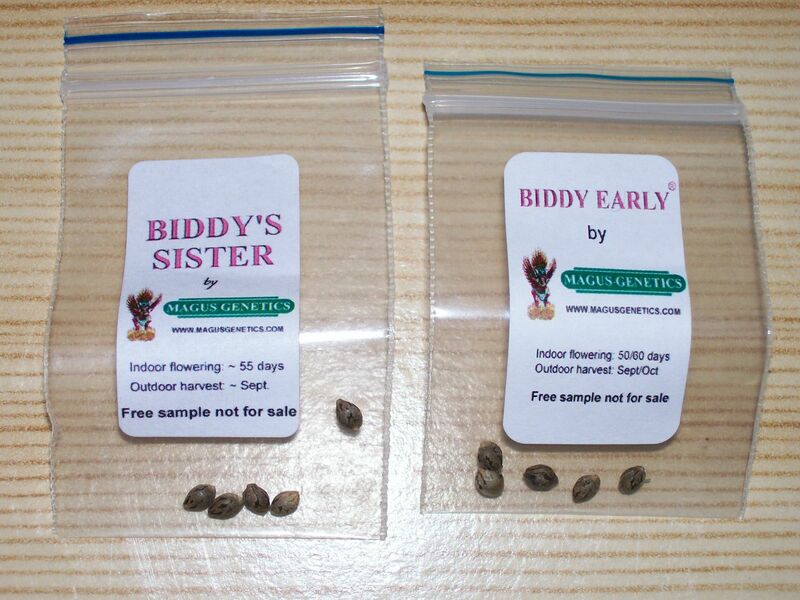 Will probably try another batch of 'Biddy Early' one day to see if I can get a lady with the same uplifting high that isn't so keen to autoflower. Thanks for the background stuff Gerrit, Very interesting stuff! Congrats with the 100% Bazza, they are regular seeds, not feminised.